Sweden has always been a guarantee for the export of epic pop melodies and infamous rock bands; however… this is rarely combined in one package. BLOWSIGHT have internalized the essence of both, and united them to create anextremely amazing, unique band with epic potential for success. BLOWSIGHT’s explosive mixture of infectious energyand musical maturity is fresh, new and sure to blast the roof off of every stage the band sets their feet upon. “Blowsight is like a big melting pot of everyone’s favorite music” states Nick Red, singer/guitarist for the quintet from Stockholm, Sweden. “it doesn’t matter if it’s influenced by Metallica, Queen, Lady Gaga, Testament, or My Chemical Romance… everything fits together”, and no other quote could describe their music more adequately either. Nick continues, “Our focus is to break down the barriers by bringing different genres together whose fans would openly fight each other out in the streets”. They’ve tagged this combination PopMetalPunk, which fits them like a glove. True to their motto- “we play what we want”. It all began in 2007 when the band won a very important Swedish music competition beating out 16,000 other bands. This incident led to a deal with Sony/BMG who shortly thereafter, released the EP “I’ll Be Around”. The first pressing sold out in less than a month, and tours ensued throughout Europe with Danzig, Life of Agony, and others. In 2009, BLOWSIGHT signed with Germany’s Fastball Music and quickly released their debut full-length “Destination Terrorville”, receiving critical acclaim by the likes of Close Up, Rock Sound, and Metal Hammer who crowned them as Band of the Month. In 2010, they released Dystopia Lane, and in 2011, the band released their Shed Evil EP, both of which also received critical acclaim. The band proceeded to embark on a extensive European tour with Sonic Syndicate, then performed at the infamous Wacken Open Air Festival in August, 2011. Fast forward to 2012 after a successful European tour with Germany’s OOMPH, the band are ready to unleash a brand new full-length album entitled “Life & Death” upon North America through Eclipse Records (Mushroomhead, Scum of the Earth, Bobaflex). On their latest effort “Life & Death”, BLOWSIGHT immediately assault the listener with the energized opening track “It’s Me You’re Looking For”. 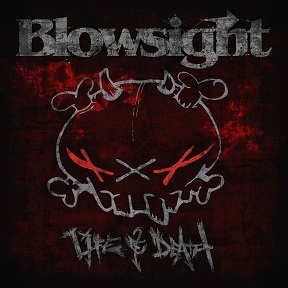 With their fierce first single “This Pain”, the listener immediately realizes BLOWSIGHT are a band with ambitions that have no limit. Perhaps the best examples of this limitless ambition are the bluesy, swinging anthem “Red Riding Blues” and the seven minute long opus “Dystopia II” which can only be described as the offspring of Queen’s Bohemian Rhapsody mating with November Rain by Guns N Roses. “Dystopia II” showcases singer Nick Red’s amazing vocal abilities, and goes through various transitions, while steadily building and solidly erupting in climax toward the end as an almost subliminal thunderclap leaves the listener in tears wanting more. After just one listen to this album, it’s easy to see BLOWSIGHT really do play what they want, and they play it well. One cannot however ignore what just might be the catchiest song from “Life & Death”, entitled “Hit on the Radio”. The song has this infectious popmetalpunk chorus that finds its way back into the listener’s mind long after the stereo has been turned off. The guitars are so damn heavy, with just the right amount of buzz, the vocals are strong and melodic, while the beat is solid and even danceable. It’s difficult to say if this is a modern rock or pop song because… it is both, and it is something that only BLOWSIGHT can deliver. Prepare yourself… the popmetalpunk invasion has begun. “Life & Death” is currently scheduled to be released throughout North America on April 9, 2013.